Jude 5 Now I want to remind you, although you once fully knew it, that Jesus, who saved a people out of the land of Egypt, afterward destroyed those who did not believe. I’ll let you decide whether to agree with her or Jesus on whether the OT is the word of God. Short version: Any definition of biblical inspiration in which hundreds of verses are blasphemous lies is malicious and/or ignorant. 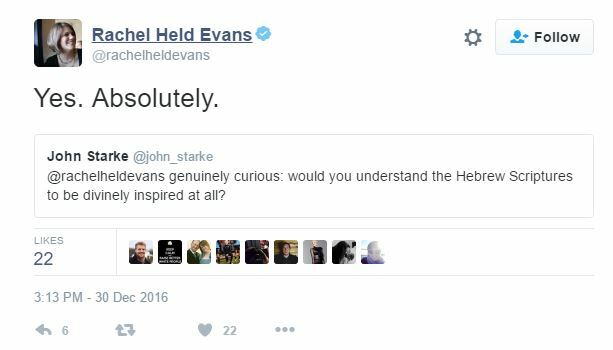 And that’s how Rachel Held Evans and much of the “Christian” Left define it. Mrs. Evans has been her usual passive-aggressive self on her Twitter page lately, attacking scripture and implicitly denying the divinity of Jesus. But when called out for specifics, she lied and said she “absolutely” believes the Hebrew Scriptures are inspired. God never told the Israelites to kill the Canaanites. The Israelites believed that God told them to kill the Canaanites. Here’s what really happened: God never got the Bible wrong. The “Christian” Left believe that God got the Bible wrong. You cannot say things like that while claiming that the scriptures were inspired. Just scan the Bible and see how many passages would be lies if what what Evans said was true. And not just lies, but blasphemous lies. It wouldn’t be a little fib if you cleared out and killed an entire country and falsely claimed it was God’s idea. Read the Bible for yourself then decide who is lying: Evans or the authors of scripture. P.S. If that wasn’t enough, check out Jes Kast, whom Evans adores, and see if her theology is biblical. The false teachers of the “Christian” Left have been getting measurably more unhinged since Trump beat Hillary three times (at last count)*. And that’s good, because with their veneer completely stripped away it will be harder for world-lovers to pretend they are really Christians. Example 1: They’ve always been pro-abortion extremists, demanding that taxpayers pay to kill the children of “Christian” Leftists, minorities and others up to their first breath and insisting that Jesus agrees with them. But now they are resorting to historical revisionism (read: lying) and full-scale mockery of anyone who would dare question their Molech-worshiping theology. They have been corrected on this many times, so they are lying wolves and not just misinformed by #fakenews. Even atheistic countries opposed abortion for thousands of years, and the church always did until about 50 years ago when some apostate denominations fully abandoned orthodoxy. The Hippocratic Oath, written before the birth of Christ by non-Jews, was explicitly anti-abortion. And even Planned Parenthood was explicitly anti-abortion up to the 1960’s. Here are a few quotes from early church leaders on abortion. Jerome called abortion “the murder of an unborn child” (Letter to Eustochium, 22.13; fourth century). Augustine used the same phrase, warning against the terrible crime of “the murder of an unborn child” (On Marriage, 1.17.15; fourth century). The early church fathers Origen, Cyprian and Chrysostom likewise condemned abortion as the killing of a child. And of course they are wildly anti-science, just as they are with climate change, transgenderism, etc. Any mainstream embryology textbook – or just plain common sense — confirms that the unborn are unique human beings from fertilization. Example 2: To poke God and real Christians in the eye a bit more, they also posted this. Then they were shocked to find that people found it offensive. They ignore this, and the rest of the Bible. Romans 1:26–27 For this reason God gave them up to dishonorable passions. For their women exchanged natural relations for those that are contrary to nature; and the men likewise gave up natural relations with women and were consumed with passion for one another, men committing shameless acts with men and receiving in themselves the due penalty for their error. Example 3: They thought that their “Christian” site must show a nonsense article about how Donald Trump allegedly holds his hands in the shape of the universal symbol for vaginas (because people tenting their hands is so newsworthy or something . . . and who knew there was a symbol for that?!) 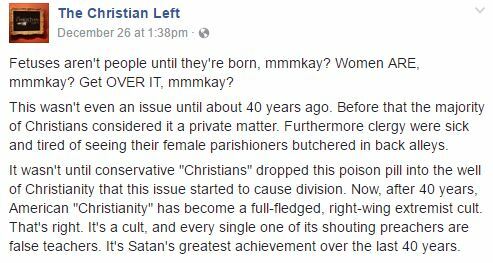 and then they banned lots of their regular “Christian” Left readers for having the audacity to point out that it wasn’t terribly edifying. Run, don’t walk from “Christian” Leftists. They aren’t just a little heretical, they are drunk, naked, running-down-the-streets-screaming heretical. You have no excuses for following them. *I didn’t vote for Trump, but man oh man am I glad Hillary lost. She was already cartoonishly evil before the election. Can you imagine how over-the-top evil she would have been had she won?! And watching the Left — including the “Christian” Left — continuously wet their pants over it the last 2 months has given me nonstop joy. **Yes, I know He wasn’t born on December 25. One of my irritations with the “Christian” Left and their theology is that it pretends to be slightly different from orthodox Christianity while it is usually 180 degrees away on the essentials of the faith and any current hot topics. Please note that by “Leftist theology” I don’t mean the theology of political liberals. I am referring to people who call themselves Christians but deny the essentials of the historic faith (i.e., the kinds of things countless martyrs died for — Jesus’ divinity and exclusivity, the authority of scripture, etc.). If you want to debate the disputable matters, go right ahead. I’m flexible on those. But words mean things, and far too many people use the term Christian in error. For example, claiming that Jesus is one of many paths to God isn’t a little different than saying He is the only way, it is the opposite. There is either one way or there is not one way. The Bible has over 100 passages teaching directly or indirectly that Jesus is the only way to salvation. If you don’t agree that it is your prerogative, but please don’t claim to be a Christian. Claiming that Jesus isn’t God isn’t a little different than saying He is God, it is the opposite. He is either God or He is not God. Claiming that the original writings of the Bible were not inspired by God isn’t just a little different than saying they were inspired by God, it is the opposite. The Bible is God’s Word or it is not God’s Word. It makes roughly 3,000 claims to speak for God, so if liberal theologians think those are all false then why do they bother with the Book at all? Their claim is that the authors of the Bible were blasphemous pathological liars because they falsely claimed to speak for God countless times. Claiming that miracles never happen (Virgin birth, loaves & fishes, healings, the physical resurrection, etc.) isn’t just a little different than saying they did happen, it is the opposite. Claiming that marriage can be for two men or two women isn’t a little different than saying it is between a man and a woman, it is the opposite. It is claiming that marriage is not just between a man and a woman and that “marriage” is now whatever we want to define it to be. The Bible couldn’t be more clear about God’s ideal for marriage and sexuality. Claiming that Jesus approves of killing children up their first breath isn’t a little different than saying, “Don’t murder,” it is the opposite. 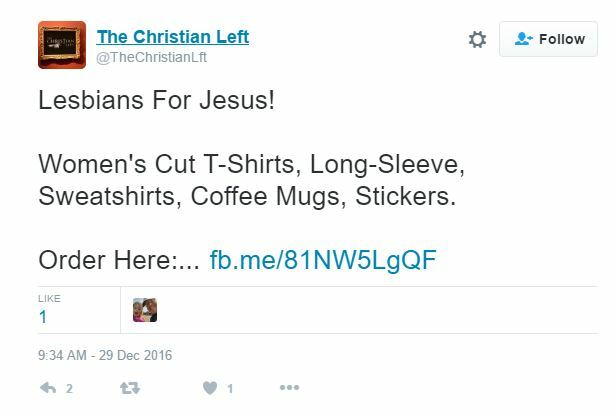 The “Christian” Left claims the opposite of what historic, orthodox, biblical Christianity does regarding the essentials of the faith. They are entitled to their opinions, of course, but it is disingenuous and misleading for them to call themselves Christians while espousing those beliefs. They have invented their own religion, which is their right. It would just be less confusing if they would give it a new name. And it would be more intellectually honest to stop taking money from people who do believe in the essentials that those denominations were founded upon. They appear to worship a fictional Gandhi-Christ. The most accurate description would be that of a Hindu sect (nothing personal, Hindus!). Run, don’t walk, from the wolves of the “Christian” Left. I love the book of Jude. So many great messages in just 25 verses, and still so relevant! He perfectly describes the “Christian” Left false teachers of today while opening and closing with magnificent passages about all that Jesus has done and will do for us. I gave this message when our pastor was sick. I had less than 24 hours notice plus a Saturday evening commitment to fulfill, so cut me some slack :-). And for some reason they had a glaring light right next to the screen in back, which was less than ideal. But I still loved being able to share these truths. The entire “fake news” agenda is a desperate attempt by the Left to make excuses for why Hillary lost. But most people get their news from the mainstream media (uh, hence the adjective, “mainstream”). The Left dominates media, entertainment and education, so they are the main source for the fakery. But in typical Leftist fashion they project their awful traits onto their opposition. Fortunately this gaming will just expose them that much more for the phonies that they are and will keep them from doing the kind of self-reflection that would lead to successful changes for them. Fake news: Hillary’s “random” photo ops to try and humanize her in the woods and at the grocery store. They just “happened” to involve “strangers” whom she knew. This is a video version of the PowerPoint slides I’ve shared before. I taught this for years to volunteers at Care Net Pregnancy Center. What was always interesting is how these great folks, who were strongly pro-life, hadn’t heard how to make the case for life and how to respond to pro-choice sound bites. And most of them had never heard of people like Kermit Gosnell, the greatest serial killer in American history, because they got most of their news from the mainstream media that successfully hid his story. Pro life reasoning from Eternity Matters on Vimeo. The “still small voice” Bible passage is often misinterpreted. It pertains to the Prophet Elijah after his amazing victory over the prophets of Baal at Mount Carmel. He has run away to avoid the wrath of Jezebel and is hiding in a cave. The portion in bold is used to rationalize mystical practices or “nudges” that God allegedly communicates to us, often in the area of decision making. But read the passage carefully and you’ll see something that should be obvious: The “low whisper” or the “still small voice” (King James version) wasn’t an illustration of a mystical communication. It was an audible statement. Note the extended conversation and message that follows. Elijah’s Mt. Horeb experience, when he heard “a sound of sheer silence”(1 Kings 19:12, NRSV), stimulated in the church a tradition of desert spirituality which pursues solitude in order to experience the divine. Practitioners of lectio divina (i.e., reading sacred things) also desire such encounters. They say: “When we read the Scriptures we should try to imitate the prophet Elijah. We should allow ourselves to become women and men who are able to listen for the still, small voice of God (I Kings 19:12); the ‘faint murmuring sound’ which is God’s word for us, God’s voice touching our hearts. This gentle listening is an ‘atunement’ to the presence of God . . . .” About Elijah’s experience of hearing God’s “still small voice”(KJV, NKJV) questions arise. Does 1 Kings 19:12 endorse contemplative spirituality? Was the prophet’s encounter with God in the cave on Mt. Horeb/Sinai a mystical “atunement”? Do not take that passage out of context to rationalize what may not be from God. Just read what his word really says and use wisdom to guide your decision making. Here’s much more on the Bible, decision making and hearing from God.